The Myanmar army’s violent displacement of more than three-quarters of a million Muslims in the western state of Rakhine cast a deep shadow over this year’s fourth Irrawaddy Literary Festival held in Myanmar’s second city, Mandalay, in November. It meant that some international authors boycotted the festival in protest. One of the festival’s international sponsors, the Manchester Metropolitan University did not withdraw its funding but its authors withdrew. They included the British Poet Laureate, Dame Carol Ann Duffy. However, another international sponsor, the University of Melbourne, did attend, arguing that the festival was independent of the Myanmar Government and that it was important not to isolate the Myanmar literary community at this time. A major objective of the festival was the promotion of free speech. A member of the festival’s board of trustees, author and cultural historian Dr Rupert Arrowsmith, who lives in Yangon, said that the festival provided a venue for the discussion of politically sensitive subjects, such as inter-faith dialogue and conflict-resolution, for which there was no other venue in the country. Many of the Myanmar authors who participated in the festival served lengthy prison terms under the military dictatorship for what they wrote, so free speech has been a major topic at each of the four festivals. This year’s program included a paper on censorship and freedom of the press. The festival organisers did not avert their eyes from the horrors in Rakhine. The program, which ran over three days from 3 to 5 November, included sessions on inter-faith dialogue, conflict-resolution, and the state of democracy in Myanmar, as well as censorship. Given the religion-based nature of the attack by the Buddhist-dominated Myanmar army on the Muslim Rohingya minority in Rakhine, and the complicity of some Buddhist monks in those attacks, inter-faith dialogue was the most direct way in which the festival confronted the atrocities. The participants in this dialogue were two Buddhist monks and a leading Myanmar Muslim cleric. The monks were Sayadaw U Nayaka, principal of the Phaung Daw Oo non-denominational school in Mandalay, and Abbot Nicholas Vreeland, a Buddhist monk in the Tibetan tradition based in India. The Muslim cleric was an influential imam, Al Haj U Aye Lwin, who was a member of the advisory commission on Rakhine State convened under the leadership of the former United Nations Secretary-General, Kofi Annan. The commission’s final report, delivered to the Myanmar Government in August, recommended swift action to resolve the citizenship status of the huge number of currently stateless Rohingya, restitution of the right of freedom of movement and of equality before the law, and reform of the police force. It also recommended urgent action to improve economic conditions in what is Myanmar’s poorest state. The inter-faith dialogue was moderated by Michael Vatikiotis, one-time editor of the Far Eastern Economic Review and now a peace mediator based at the Humanitarian Dialogue Centre, a Swiss-based private diplomacy organization. His book, Blood and Silk: Power and Conflict in Modern Southeast Asia, was published earlier this year. Imam Aye Lwin is also the Chief Convenor of the Islamic Centre of Myanmar, and is a founding member of Religions for Peace in Myanmar. He said that while the military junta had frequently used religion as a political tool, until now this had become rare since the elections won by Aung San Suu Kyi’s National League for Democracy in 2015. Both he and U Nayaka emphasized the role of education in developing attitudes of tolerance, and spoke of the urgent need to provide economic opportunity for non-Muslims and Muslims alike in Rakhine. However, the first task was to find an antidote to what Imam Aye Lwin called the toxic mindset afflicting the people there. He recounted a brief history of the founding of Mandalay, in which churches, mosques, Buddhist temples and places of worship of all kinds had been built. A rest house for Burmese Muslim pilgrims had been built in Mecca at the Burmese kingdom’s expense. In 1980 the Saudis had turned it into a hotel. Vatikiotis asked the panel about a remark by a senior Buddhist leader in Myanmar earlier in the week suggestive of the idea that non-Buddhists were less than human. Abbot Vreeland replied that Buddhist practitioners were not meant to discriminate even between humans and non-humans. Asked about the role of his school in promoting inter-faith tolerance, U Nayaka said that it was part of the educational ethos of the school to teach in such a way as to transcend religious and racial differences. Conflict-resolution was another theme of the festival. This discussion involved Imam Aye Lwin, Michael Vatikiotis and the Asia news editor of the Financial Times, Victor Mallet, whose book on the Ganges, River of Life, River of Death, has just been published. Imam Aye Lwin repudiated claims by those who advocated or practised violence that they were acting in the name of Islam, asserting that all people had the right to practise their own faith. Vatikiotis, who has extensive experience as a peace mediator, described Myanmar as one of the most complex conflict zones in the world. Its internecine wars had been going on for generations, and some of its fiercely independent hill tribes, such as the Kachin, manufactured their own armaments. Arguing that the support of the international community was essential if peace processes were to succeed, he cited the example of Colombia, where a deeply entrenched conflict between the Government and the insurgency led by the Revolutionary Armed Forces of Colombia (FARC) had been resolved with the “muscular” support of the international community. In Myanmar, however, the Government had taken it on itself to conduct its own internal peace negotiations and as a result there had been many meetings but very little outside pressure. Without this, it would take a long time to reach an agreement. Vatikiotis said that in his experience it was essential to have a road map for negotiations which started with a vision for the future. Having agreed on a vision for the future, it was then possible to deal with the issues of the past, to find a way to transfer power and to hold people accountable as part of a reconciliation process. However, in Southeast Asia there was a tendency to park the past and attempt to move on without ever resolving the issues, because doing so was too painful. This allowed grievances to fester and conflicts to re-ignite. In Myanmar, after seven decades of conflict, discussions about reconciliation had not even started. Moreover, events of the past commonly provided justification for present actions. A session given by the American journalist Delphine Schrank on the triumphs and failures of Myanmar’s democracy movement, also elicited a substantial discussion on the horrors in Rakhine. 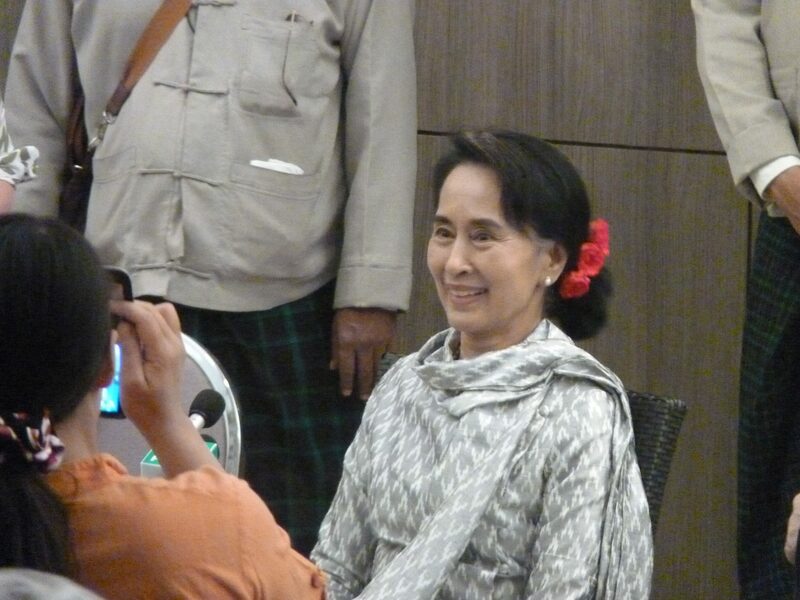 Schrank was Myanmar correspondent for the Washington Post from 2007 to 2011. 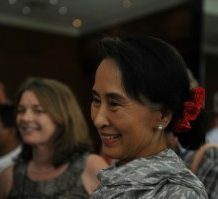 Her 2014 book, The Rebel of Rangoon: A Tale of Defiance and Deliverance in Burma, was an account of the political struggles by three dissidents, members the National League for Democracy, under the repressions of the military regime. These three authors were among 32 members of the international literary community who attended the festival. 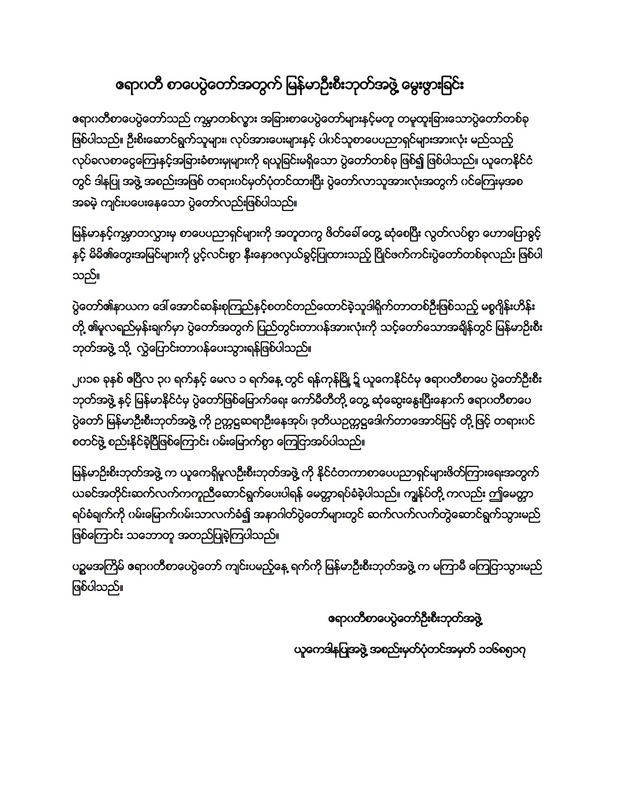 Aung San Suu Kyi, the festival’s patron, did not attend the festival but sent a written message of support. The festival is run on a volunteer basis by a board of trustees chaired by Jane Heyn, who founded it in collaboration with her husband, Andrew Heyn, former British ambassador to Myanmar and now British Consul-General in Hong Kong. It has a budget of less than $100,000, all from sponsors independent of the Myanmar Government. The Myanmar literary community turned out in significant numbers. Festival organisers said 120 Myanmar authors had attended, the largest number of the four festivals so far. Dr Arrowsmith pointed to this as fulfillment of one the festival’s objectives, the promotion of Myanmar literature and authors. 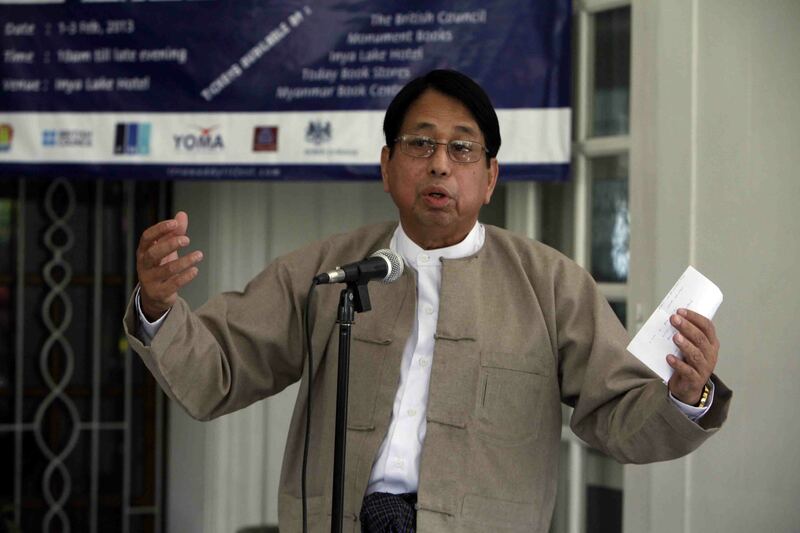 A further objective, he said, was to open up Myanmar to international literature, the country having been something of a “closed shop” under the military, and to promote the development of the English language to help build connections with the outside world. 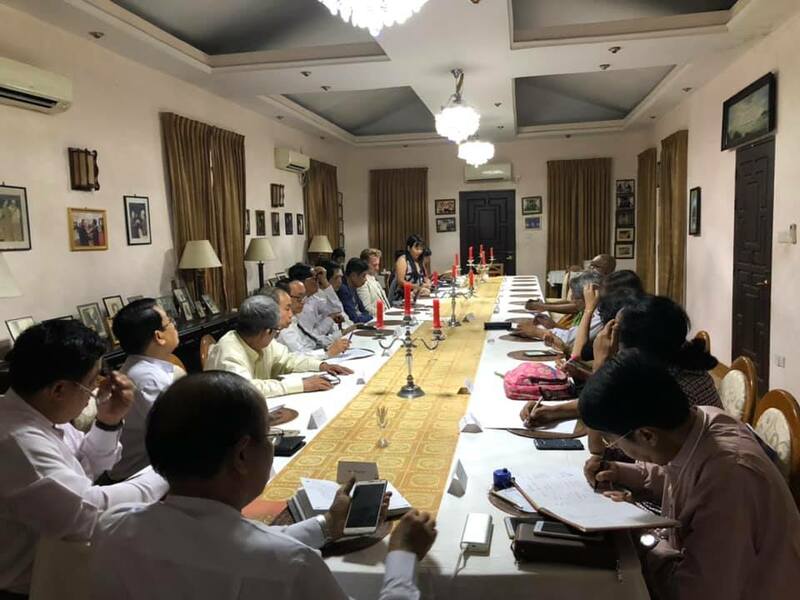 One spin-off from the festival had been the development of a substantial training program for translators sponsored by the Jefferson Centre, which is attached to the US consulate in Mandalay. A team of volunteer trainees provided simultaneous translations at each of the festival’s 73 sessions. The festival’s contribution to the re-building of civil society in Myanmar is impossible to assess. 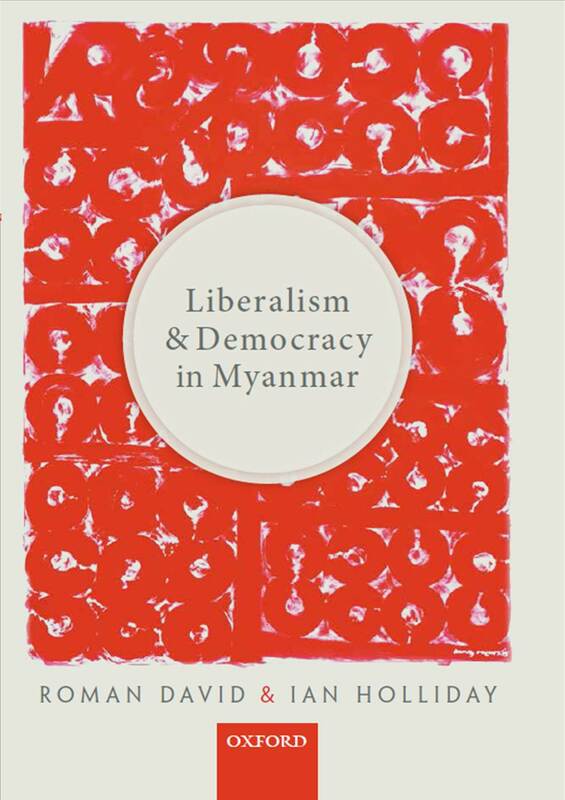 However, the evidence suggests that Myanmar’s authors feel emboldened by it. It also provides a venue for free discussion of politically sensitive issues in an atmosphere of open inquiry, and provides a small but important way in which Myanmar can connect with the outside world. Dr Denis Muller is a former Age journalist. He teaches media ethics and media law at the Centre for Advancing Journalism at the University of Melbourne. He attended the festival as a member of a three-member group from the University and delivered the paper on censorship and freedom of the press. ← Birth of the ILF’s Myanmar Board!